Friday, Aug 10, 1888 About as cool, rather pleasant till first of eve had shower, lightening striking tree in Walkers yard Ellery & I had as quiet breakfast but some later this morn-, after usual chores, with some extra he spent most time at store, here to go with me to early dinner at Mrs Wedgewoods, & also took supper with them. I spent part P.M. in with Mrs Brayton, enjoyed what little found to do in kitchen, with usual chores. Saturday 11 As cool, & quite as pleasant after some rain in night. 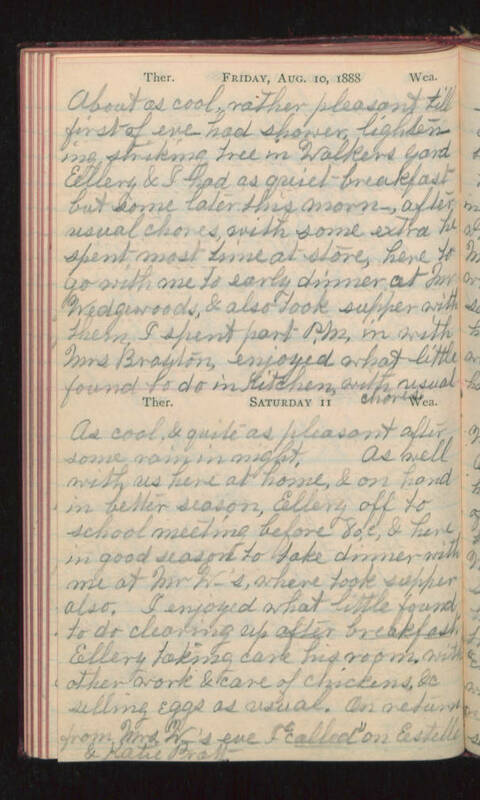 As well with us here at home, & on hand in better season, Ellery off to school meeting before 8 o,c, & have in good season to take dinner with me at Mr W-'s, where took supper also. I enjoyed what little found to do clearing up after breakfast. Ellery taking care his room, with other work & care of chickens, &c selling eggs as usual. On return from Mrs W-'s eve I "called" on Estelle & Katie Pratt.